Latin America’s leading LGBT Conferences and Exhibitions Company, Confex has confirmed Merida in Mexico’s Yucatan as the host of the Fifth edition of its LGBT Business Expo, Latin America’s leading LGBT business event. The LGBT Business Expo is B2B and consumer event targeting all elements of the LGBT community. The event is scheduled to take place from September 18- 19, 2015. The event is designed to maximize networking business and educational opportunities. The LGBT Business Expo was first held in 2011 in Puerto Vallarta and has continually grown since almost doubling in scale with its 2012 edition in Cancun and continued its growth journey in 2013’s International LGBT Business Expo in Guadalajara, Mexico and 2014’s edition in Vallarta-Nayarit. The 2015 event will include education presentations and workshops from many leading global LGBT thought-leaders focusing in the platforms: Tourism, Corporate, Film, Academic, Entrepreneurs, Technology, and Media. Leading researchers from universities worldwide will also be present at the new academic platform entitled “International Congress on Sexual Diversity Studies”. The LGBT Confex will feature the diversity of activities and services that the city has to offer for the LGBT Consumer. They will be working with the city of Yucatan, its tourism and convention bureau, local entrepreneurs targeting the LGBT consumer in the State of Yucatan. The OHL Classic at Mayakoba made into the history of golf in the year 2007. The tournament became the first to be a part of PGA TOUR event to ever be contested outside of the United States or Canada. At present, it remains México’s only PGA TOUR event and is regarded as one of the finest tournament by professionals, sponsors and spectators alike. The OHL Classic at Mayakoba on a very fast pace is building a strong tradition and a proud history. Legendary golfers and an outstanding golf course come together each year to rewrite golfing history and make exciting results. The OHL Classic at Mayakoba this year will be aired for the first time on popular sports channel ESPN. This great news is confirmed by the event’s organizers. The 2014 edition will take place from November 10 till 16 at the swanky Mayakoba resort complex in the Riviera Maya. A whooping amount of 6 million dollars is this year’s prize money. The winner will take home 1.1 million dollars and 500 FedEx Cup points. The organizers are hoping to attract around 15,000 people throughout the event. It’s great to know that the estimated number of spectators is on a rise since the tournament was confirmed that Mexican Carlos Ortiz from Guadalajara, as it’s a very intimate event when compared to other tours. Mexico will be participating as a member of the PGA Tour, after receiving his membership card to participate in the official season this past August 25. Beautiful golf course at Mayakoba will be the green carpet that will unfurl at Mexico and bring the world right at its door step. The OHL Classic golf tour is the great way to celebrate Mexican wave right on the golf course. Wondering how to have loads of fun and save the local ecology at the same time? Try Lionfish Challenge in Akumal. 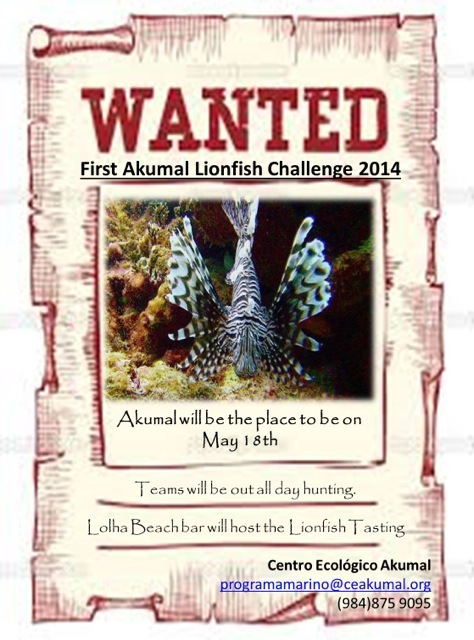 On May 18th, 2014 Lionfish challenge will be held in which teams will go out to the sea to hunt Lionfishes. The teams have to turn in their catch at 4.00 pm at the Akumal Dive Center. The judegs will then weigh and measure to declare the winner of the hunt. Same evening, Lol Ha Beach bar will host a free Lionfish Tasting. If you are an experienced Lionfish hunter and would like to register your team or find a team to join, email CEA Akumal at info@ceaakumal.org or call 52 (984) 875 9095. A complete listing of rules and regulations can be found here on the Akumal Lionfish Challenge Facebook event page. The sole motive of organizing this hunt is more serious than fun. Lionfish is not indigenous to the Caribbean Sea. They were probably introduced by someone or swept in by the hurricanes in Florida. They are normally found in the Indo-Pacific or tropical reefs of the South Pacific Ocean. Although beautiful, these fishes are quite harmful to the coral reefs of Akumal. Lionfish is a predator and sit at the top of the food chain with no enemy to restrain their population. Since they are voracious eaters they are the foremost reason for the depletion of reef fish, lobsters, snapper etc. Lionfish proliferate quickly overwhelming the other marine species. Thus to ensure that Akumal’s famed coral reef survives this onslaught, the Annual Lionfish Challenge is being held. This way not only Lionfish population is restricted, you also get to enjoy the lip-smacking lionfish dishes. May is the month of fishing tournaments in Puerto Morelos. It’s a great time of the year for the people of ‘La Joya del Caribe’ and Puerto Morelos condo owners as two fishing tournaments are scheduled to take place in May. 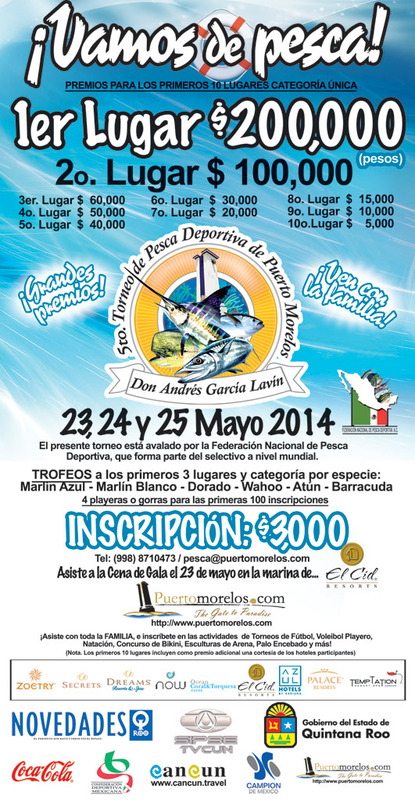 The Puerto Morelos Fishing Tournament 2014 “Don Andres Garcia Lavin” is scheduled during May 23, 24, 25 2014. Many events such as beach volleyball, Football, swimming and Bikini contest apart from the fishing tournament will be held. you can enjoy these events with your family and kids. Puerto Morelos Fishing Tournament 2014 is a popular event where hundreds of fishermen from Puerto Morelos, Playa del Carmen, Tulum as well as other countries participate. This charming fishing village is making its mark as a destination with a difference. If you want to experience true Mexican flavor then Puerto Morelos real estate region is perhaps what you should try at least once. The FINA aquatic community will gather on February 27-28, 2014 in Cancun, Mexico (Is cancun safe? )to attend the FINA World Water Polo Conference, a unique opportunity to hear from established team sports, newly popular sports, and representatives from the Water Polo family about the innovative ideas they have used to ensure continued success. Under the motto “Sharing the Magic of Team Sports”, the conference will provide dedicated leaders within Water Polo with an exciting platform where FINA delegates will hear from international experts, drawing on their real-world learnings and giving practical tips to gain new insights and inspire visionary thinking that can be used in the future. To view the detailed programme please click here: programme. The great mix of people and the focus on offering enough time for discussion will certainly bring some interesting insights into how outsiders, athletes and sponsors view Water Polo and wish to make it an even more attractive game. Media outlets such as Twitter and Live Streaming will be used to broadcast the conference. Mexico is a nation that loves to party! The country organizes splendid events and festivals throughout the year. Catch one and you are sure to come back with wonderful memories of your stay in this vibrant country. Dia de la Candelaria or Candlemas, is celebrated all across Mexico on the 2nd of February. On this day, Mexicans get together with family and friends to eat tamales. Thousands of people assemble in the riverside town of Tlacotalpan to revel in the festivities that feature a magnificent image of the Virgin being floated down the river. 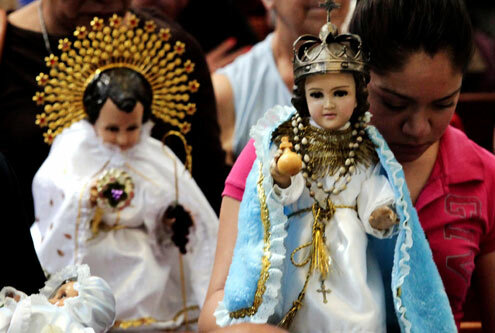 In towns like Tlacotalpan and Veracruz, Candlemas is celebrated in a big way with parades and bullfights. But the most memorable part is the Son Jarocho festival, a 3-day event, which happens during the same time and exhibits conventional Veracruz-style music. 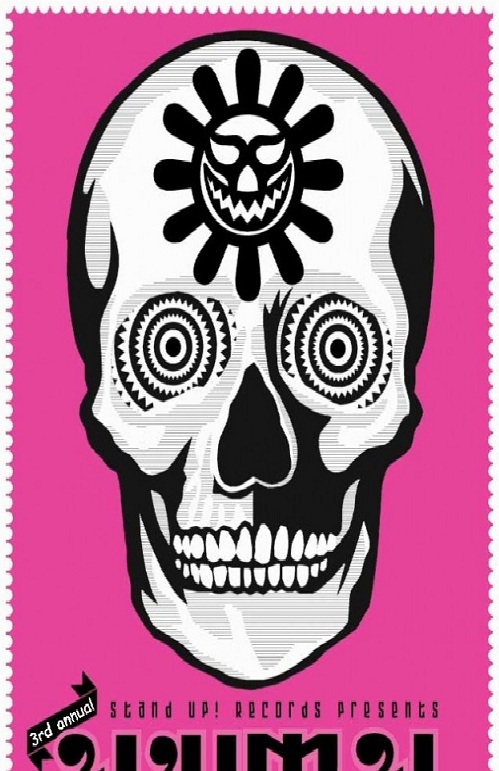 Organized in mid-March, most of the hullabaloo for this 2-week event unravels in Mexico City’s downtown Historic Center. Roughly 50 venues sprinkled throughout the city present the very best in national and international acts, including opera, dance, music and theater. Every year in October, the vibrant and bustling colonial city of Guanajuato presents the annual Festival Cervantino (Cervantino Festival). This cultural festival, funded by the State, is one of the main arts and cultural festivals in Mexico and Latin America. It promotes performing arts from all across the globe including opera, theater, visual arts, contemporary dance, film and literature along with a variety of conferences, exhibits and workshops. Plazas, churches, historical buildings and even museum spaces act as venues for these events. Long ago, this was a rather a small festival celebrated in honor of Spanish novelist Miguel Cervantes, (of Don Quijote fame), but in present times the the Cervantino has transformed into one of Latin America’s premier arts spectacle. Every year, the Morelia Film Fest (FICM) honors the career of an eminent figure from Mexican cinema born in Michoacan. The festival’s mission is to bring together filmmakers, the public and the international film community. This festival stages work of new and upcoming talents in Mexican cinema and puts up an incomparable display of all the treasure that Michoacan has to offer. Funky bars and sidewalk cafes are brimming with activity around the main square, where crowds assemble at night for open-air screenings and other cultural events. Worshops, conferences, open-air performances, movie cylcles and exhibitions are organized in Morelia, Patzcuaro and Mexico City. With so much happening, there is no doubt that the Morelia International Film Festival is the ultimate choice for film buffs and lovers of culture. Carnaval celebrations in Mexico are some of the most cheerful and vivacious you will find anywhere else (Read about Cozumel Carnaval). Held the week before Ash Wednesday, the dates for Carnaval vary from year to year just like the dates for Easter. The Carnaval celebrations in Mexico feature flamboyant parades, dance performances, live music, carnival games, live entertainment and of course, a whole lot of partying! The biggest Carnaval celebrations take place in Veracruz and Mazatlan. The 9-day event in Veracruz, usually begins in the month of March, which is just the same time when the festivities begin in the town of Mazatlan. You can either shake a leg to the salsa beats in Veracruz or enjoy the brass band sounds of Mazatlan. The noted Guelaguetza festival is held each July in the Mexican state of Oaxaca. Locally known as “Los Lunes del Cerro” or ‘Mondays on the Hill’, as most of the festivities take place on two successive Mondays at a large amphitheater situated on top of a hill. A beautiful cultural event dating back to ancient times, this lively festival lures visitors from all across the world. There is more to Guadalajara than just tequila or mariachis, tequila. Also famous for its vibrant and independent music and arts scene, Guadalajara hosts the Fiestas de Octubre (October festival) presenting live music, a good dealof dancing, never-ending food, carnivals, displayss of art works, markets with more than 700 hawkers, street entertainment and several free events. Much of the action related to the Guadalajara October Festival is centered around the Benito Juarez Auditorium. In Mexico City, every year on the 22nd of November, tribute is paid to St. Cecilia, the patron saint of musicians. Mariachi bands and musicians from regions in northern Mexico and Veracruz get together in Plaza Garibaldi for an open-air party which involves drinks, dancing and singing. Usually held on the last weekend in August in the colonial town of Zacatecas, La Morisma features a fabulous make-believe battle as a tribute to the victory of the Christians over the Muslims in old Spain. Two battling armies, with more than 2000 participants and accompanied by bands of musicians, parade through the streets in the morning and then act out two battle sequences. 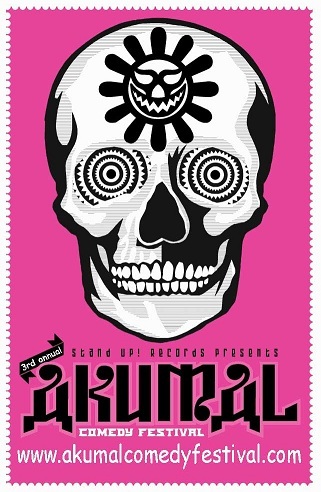 Akumal Comedy Festival has already made a mark and a place in the audiences heart and Akumal‘s event itinerary. This is a completely free comedy festival in which over a dozen professional comedians from the USA perform in 7 shows in four distinct venues in Akumal over three days. Conceived by Dan Schlissel (Grammy Award winning producer and founder of Stand Up! Records) and comedian/actor Gus Lynch (Saving Silverman, North Country, I Spy), this event highlights the comedic talent of stars as well as the tourist potential of Akumal.